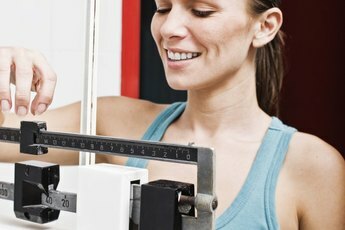 Lose inches with healthy foods and plenty of exercise. 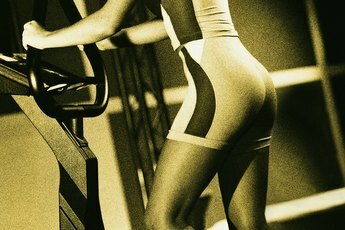 Most women, at some point or another, want to lose inches and tone up their muscles. With this in mind, many drug companies market fad diet products that promise fast weight loss. You might be tempted by these items, but a far better way to lose weight and keep it off is to combine exercise with a low-calorie meal plan. You're likely to start noticing results in two to three weeks as long as you stick with a consistent routine. It is important to talk to your doctor before starting a new exercise or eating program. Write down your meals and workouts in a notebook. A 2008 Kaiser Permanente study revealed that women who kept track of their eating habits lost twice as much weight as those who simply ate healthy and exercised. A written record holds you personally accountable, allows you to track your progress and lets you see which aspects of your weight-loss plan are working and which ones aren't. Eat a variety of foods from each food group. This includes fruits, vegetables, lean protein, low-fat dairy and whole grains. These foods help you get the recommended amount of nutrients that women need for good overall health without overloading you on calories. In general, women need 1 1/2 to 2 cups of fruits, 2 to 2 1/2 cups of vegetables, 5 to 6 ounces of grains, 5 to 5 1/2 ounces of protein and 3 cups of dairy each day. Cut 500 to 1,000 calories from your diet each day. This helps you lose 1 to 2 pounds in a week. Combined with exercise, you'll drop inches and tone up at the same time. Eliminate high-calorie foods, such as fast food, fried food, frozen dinners, soda, candy, cake, chips and packaged snacks, which are not conducive to weight loss and contain little to no nutrition. Engage in five hours of cardiovascular exercise each week. This ensures good health, but also helps you drop inches and lose weight all over your body. Break this time up throughout the week to keep your metabolism going. Anything that gets your heart rate going works. Walking, jogging, dancing, biking, swimming and organized sports are good choices for women. Include two or three 20- to 30-minute strength-training sessions each week. This type of exercise is important for toning your muscles and building lean mass. Lean muscle mass boosts your metabolism, which helps you burn calories. Using resistance bands or lifting weights are good choices for women and can be done at home or at the gym. Start with one set of 12 repetitions and add sets as you gain strength and endurance.